The Russian democratic movement is not merely a political phenomenon. Its values and aspirations are expressed in culture, most importantly, the music. Like I promised at Principia College, I’ll post several pieces on the music that inspires me and other Russian activists. Dissenters’ music first appeared in the Soviet Union. Names of Alexander Galich, Vladimir Vysotsky and Bulat Okudzhava, so-called “bards,” were known to many Russians even in 1960s. However, the real boom of protest culture took place in late 1980s during the Perestroika. Rock music emerged from underground, openly and bluntly criticizing the stagnation and repressions in the country. Mashina Vremeni (Time Machine) and DDT were some of the most prominent bands of those days. Some rock idols of Perestroika era still perform, but gave up their rebel sentiment. Andrei Makarevich (leader of Mashina Vremeni) and Boris Grebenschikov (leader of Aquarium) have been regularly meeting Vladimir Putin; Alisa band has performed at Nashi’s concerts. Some others have deceased like Viktor Tsoi (leader of Kino band) or Igor Talkov. Another day is crossed out on the calendar grid. And over a glowing city, the shadow will fall. It’s the demand of our hearts. It’s the demand of our eyes. In our laughter, in our tears and the pulse in our veins. But in the kitchen, like a blue flower, gas burns. And there’s nothing more left, it’s all up to us. Or skillful gestures of our hands. We don’t need this all to understand each other. And suddenly we get scared to change something. 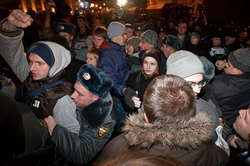 Another protest rally was dispersed Saturday night by Moscow police. The action was a part of the so called Strategy 31–a campaign in support of freedom of assembly guaranteed by paragraph 31 of the Russian Constitution. This basic right to hold peaceful demonstrations is routinely violated by the authorities: major opposition rallies are banned, often without any legal grounds, their participants get arrested and beaten by the police. The situation is particularly bad in Moscow where all government institutions are located and authorities are especially rigid (although legislation is the same in all regions). As a part of this Strategy 31, several human rights and political activists (as different as prominent Soviet dissident and human rights defender Lyudmila Alexeeva and radical left-wing opposition leader Eduard Limonov, for example) decided to hold a demonstration at Triumfalnaya Square in Moscow downtown on October 31. The action was, as usually, banned; the authorities explained that some kind of a “military-patriotic celebration” was planned for the same time at the same place. In order not to provoke arrests, organizers called participants not to bring any flags or banners or chant slogans. “How long will the police stay there?” they asked, and suggested that people should wait until the police leave the square. This provocation was also a signal to start a crackdown on the protesters, most of whom were standing steadily and silently according to the general plan. About 70 people were arrested. Police officers simply pointed at certain activists and they were immediately dragged into police vans. Many others were arrested for just being too close to the scene. 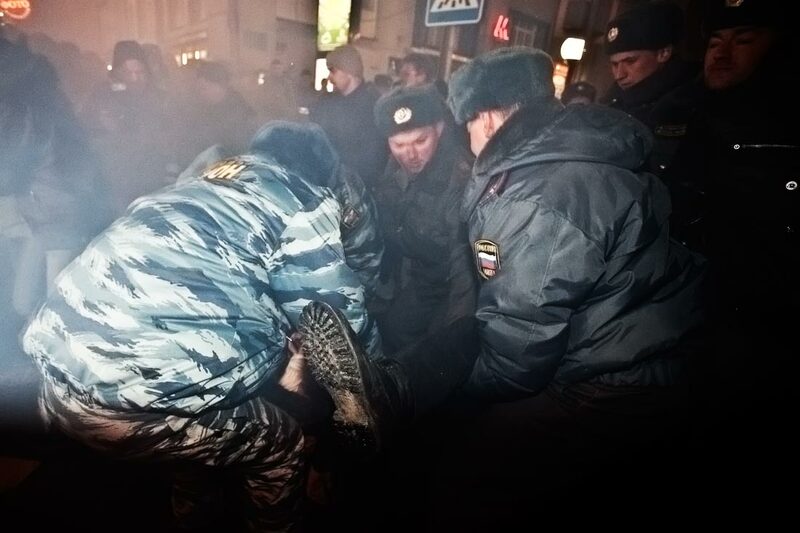 Although no resistance was offered, policemen and soldiers beat people while dragging them. According to Russian bloggers, the police even went so far as to try to arrest an American diplomat, Vice-Consul Robert Bond who was observing the rally. Photos of Mr Bond surrounded by the police and showing them his ID card have been posted in many blogs. I was arrested while trying to tweet what I saw. Apparently, one of the officers recognized me. Along with some 20 more people in the bus I was taken to a police station where we were charged with… lighting flares, chanting slogans and throwing leaflets–the ones that Putinyouth were throwing. As the police officers were filling in the papers with these fake charges, we looked at the walls of the police station’s lecture hall. Portraits of proud police officers as well as of Vladimir Putin and Dmitry Medvedev hung there next to Yagoda, Ezhov and Beriya, the three heads of Stalin’s NKVD and Gulag. As democracy and civil rights in Russia are diminishing with every year, the country is becoming more and more a police state. The voice of dissent is silenced by cynical and cruel country’s leadership. At the same time, Western public opinion and governments generally turn a blind eye to this trend in hope to buy Kremlin’s favour. I start writing for The Huffington Post, one of the leading American political blogs. Here is my first column for their recently launched World News section, on the case of Anna Politkovskaya. Four men, two of them are officers of Russian special services and two others are Chechens, are being tried in the Moscow District Military Court now. They are accused of organizing the murder of Anna Politkovskaya, one of the most outrageous crimes in Russia’s recent history. Anna Politkovskaya was a prominent Russian journalist who worked for Novaya Gazeta newspaper. Most of her work was dedicated to the Northern Caucasus and in particular to Chechnya, devastated by two wars, poverty, terrorism and unbelievable lawlessness. She went where misery was too great for people to bear. She investigated police and army brutality; she helped Russian prisoners of war; she supported victims of terrorism. She was respected and trusted by both the Chechen separatists and the victims of Chechen terrorist groups. She was the one who brought drinking water to 800 hostages in the Moscow theatre Nord-Ost in 2002. When terrorists seized a school in Beslan in 2004, she immediately went there to negotiate a peaceful solution of the crisis. However, she didn’t make it to Beslan. She was poisoned on the airplane, as her colleagues believe, by Russian secret services who didn’t want her to interfere into their own plan. She survived but while she was in the hospital, the Russian army stormed the school. 331 hostages were killed as a result, most of them children. Anna wrote a highly critical book Putin’s Russia in 2004 and participated in a founding conference of the Other Russia opposition coalition in July 2006. Russian authorities as well as the pro-Kremlin Chechen leadership despised Anna for her activities and didn’t even try to hide it. When she was killed, then-president Vladimir Putin tried to defend himself against suspicion in a very cynical way by saying that “her death caused more harm than her work”. The hitman was also not found. Detectives say that the man who shot five bullets at Anna is Chechen Rustam Makhmudov and is now hiding abroad. Two his brothers are under trial for organizing the murder of Politkovskaya. Two others defendants are a former officer of UBOP (police unit responsible for fighting organized crime but also used against political opposition), Sergey Khadzhikurbanov, and acting FSB Lieutenant-Colonel Pavel Ryaguzov. Novaya Gazeta staff organized their own investigation and said that these defendants were most probably involved in the crime but they played more a supportive role. The very beginning of the trial was marked by a serious scandal that raised new questions. The process was initially open to the public but at the second hearing the judge, Evgeny Zubov, decided that no journalists will be allowed in the court room. The reason was the jury’s request to close the process: the jurors were reportedly afraid of the media. However, the next day juror Evgeny Kolesov gave an interview and claimed that there had been no such request and nobody asked to get journalists out. He said that a court clerk entered the jury’s room before the hearings and asked them to sign a written statement that they want the process to be closed. All the jurors refused to sign it. But still, the judge didn’t care. Nineteen out of 20 jurors signed a petition to the judge saying that they don’t have any objections to the open process. Evgeny Kolesov sent the judge a letter in which he said that he didn’t want to participate in an “unfair trial” and refused to stay in the jury. The judge had to reopen the process after these events. However, it is still unknown what he wanted to hide so badly. Is it some links to the murder that go high into the ruling elite? Or is it related to the FSB’s reported surveillance of Politkovskaya? We will hopefully know soon. Update: Rustam Makmugov, the suspected killer, made a statement that he was ready to surrender himself to the police if fair trial is guaranteed for him. Unfortunately, such a condition is very hard to meet in Russia. RobertAmsterdam.com has published my column on liquidation of SPS, the democratic party, which I used to be a member of. This party has always been very contradictive since it incorporated two different wings: liberal, which criticized Putin for establishing dictatorship, and conservative, which supported Putin for his economical policy or, later, simply because it appeared more pragmatical. Most recently, this party was literally sold to the Kremlin and liquidated at a staged convention last Saturday. Here is my insight into its history. On 15 November, Union of Right Forces (SPS), one of the two remaining democratic parties in Russia, was liquidated by its own members at an extraordinary convention in Moscow suburbs. This was, as openly admitted, a deal between the party’s leadership and the Kremlin. Some of the former SPS members will now join a new puppet party Right Deed (Pravoe Delo) while dissenters will participate in creation of Solidarity opposition movement. SPS was a very contradictive organization from the day one. It appeared not long before the 1999 parliamentary elections as a coalition of liberal (in European sense) and conservative movements and parties. The liberals included the oldest democratic party in Russia, Democratic Choice of Russia (DVR), led by ex-PM Yegor Gaidar, and Boris Nemtsov’s Young Russia (Rossiya Molodaya) movement. Ironically, the name of Nemtsov’s organization was later taken by a Kremlin-sponsored group of provocateurs. The conservatives were represented by another ex-PM Sergey Kirienko (now a member of Government) with his New Force (Novaya Sila) movement and by the father of Russian privatization Anatoly Chubais among others. The strange structure of the party caused ambivalence in its position and activities. The liberals criticized Putin for establishing authoritarian regime and wanted to join the opposition while the conservatives supported Putin’s economical policy and tried to cooperate with the Kremlin. The parliamentary campaign in 1999 was mainly influenced by the conservative wing with its slogan “Putin for president, Kirienko for the Duma!” Soon after this program was fully implemented, Sergey Kirienko left the Parliament and became Vladimir Putin’s representative in Volga Federal District. Some of his former colleagues like Boris Nemtsov were at the same time trying to oppose Putin’s crackdown on NTV, the most popular independent TV channel. But even this one of the earliest anti-democratic moves of the new president was done by the hands of Alfred Kokh, Chubais’ colleague and close friend! As Boris Nemtsov participated in protest rallies against the takeover of NTV, his fellow party members celebrated the success of this “special operation” (I have witnessed it myself). The party’s schizophrenia was arguably the main reason for its loss of popular support. Putin’s followers who voted for SPS in 1999 switched their support to United Russia while the opposition voters didn’t believe SPS and simply stayed at home. As a result, SPS lost the 2003 elections and stayed out of the parliament. Many people hoped that this defeat would force the party to choose its side. However, it never happened. Since Kirienko left SPS, all of its public leaders were liberals, they maintained the critical to the Kremlin stance of the party and attracted new activists from the opposition. But the party’s funding was mostly provided (especially after the arrest of Mikhail Khodorkovsky and the loss of elections) by Anatoly Chubais, many regional branches only existed de jure and consisted of UES (the state energy company headed by Chubais) employees. In addition, most of the party’s officers were paid by and therefore loyal to Chubais and his conservative wing but had to follow orders from party’s political leadership, mostly liberal. This made both wings of the party dependent on each other and predetermined its end. Still, there were a few attempts to cure the party’s split personality. One of SPS’ leaders and ex-senator Ivan Starikov headed a riot against Anatoly Chubais and his conservative wing by going for the party chairmanship in 2005. He claimed that SPS must become a part of the opposition and shouldn’t compromise ideals of democracy for Kremlin’s favor. The conservative wing had no political figures to stand against Starikov and many expected that he would win. However, just before the national convention a compromise figure, Nikita Belykh, was introduced by Boris Nemtsov. Chubais’ closest deputy, Leonid Gozman, was to become the vice chairman of the party to counterweigh liberal Belykh. So, schizophrenia in SPS was saved (and even institutionalized by introducing the new vice chairman position) by both of its parts. They truly felt that they couldn’t do without each other! Nikita Belykh tried to balance both wings of the party for several years but it was impossible. The more SPS hesitated to join the opposition, the more supporters it lost. Starikov and some of his followers were the first to leave the party in 2005. Eventually, Starikov joined Mikhail Kasyanov’s People’s Democratic Union and is now one of its leaders. I myself left SPS in April 2007 when Belykh supported an attempt of party’s apparatchiks to destroy the Moscow branch, which has always been liberal and opposition. The party’s support and influence was disappearing day by day. The last attempt to bring SPS in opposition was made in late 2007 before the parliamentary elections. When Putin became #1 in United Russia’s list of candidates, it made impossible even for SPS conservatives to support him. The second reason was that Chubais ceased to sponsor the party and its dependence on him diminished. Nikita Belykh and other party leaders criticized the president in the media, campaign printed materials were openly anti-Kremlin, it even officially participated in a Dissenters’ March–something that had been severely punished just a year earlier. But the split hasn’t gone anywhere: some regional leaders refused to oppose the administration, some even changed sides, others simply didn’t know how to work under government’s pressure. After losing the elections SPS largely returned to its older state with two wings struggling against each other. It appeared, however, that the liberals were to win. There was one other actor that didn’t like an idea of having a schizophrenic party in the country–the Kremlin. What they wanted to see is a controlled, predictable and loyal quasi democratic party, which might be used to convince the West that we’ve got pluralism. At first, they attempted to use spoiler parties like Democratic Party of Russia (DPR) but they couldn’t fool many people: SPS was still there. And the worst of all, SPS had an official registration that allowed the party to go for the elections. Since more and more people in SPS realized that there was no other option rather than to join the opposition, the Kremlin’s well-entrenched electoral system became endangered: it was based on not allowing any uncontrolled elements even to appear in the ballots. What would happen if Russian citizens had an opportunity vote for Kasparov or Kasyanov or even both? Nobody knows. And Kremlin surely doesn’t want to know. So it decided to liquidate SPS. Of course, this special operation could be done by simply “re-checking” the party and taking away its registration, as it was done to the Vladimir Ryzhkov’s Republican Party of Russia before. But this would cause some political troubles for Putin, both domestic and international: SPS was a well-known and rather large organization. Therefore it was decided to destroy the party with its own hands. What still strikes me is how easily it was done! Gozman agreed to shut SPS down in exchange for a “pardon” from the Kremlin. Belykh left the party but didn’t try to prevent its liquidation. Only a small number of devoted liberals kept struggling against Gozman till the last day. Some of them even organized a picket near the place of the party’s convention and said, “If you have conscience, don’t vote for [the liquidation]”. According to the results of the voting, only 11 delegates had conscience out of 108. At the end of the day, the liquidation of SPS may be a good thing. It’s true that this party had many true democrats and liberals but these people haven’t disappeared. On the contrary, now you can easily tell them from the others, who had nothing to do with liberalism but participated in the same party. The latter will join a new Kremlin’s pseudo-democratic party Right Deed, the first will join the opposition Solidarity movement or other opposition organizations. It is sad, however, that the only way to cure schizophrenia was decapitation. Here is my latest column for RobertAmsterdam.com on Medvedev’s plan to change the Constitution. On 5th November the world’s attention was drawn to American presidential elections and the victory of Barack Obama. Meanwhile, Russian authorities used this day to declare an unprecedented reform in the country’s recent history—changes to the Constitution. Dmitry Medvedev in an annual address to the houses of the Parliament suggested that the presidential term should be increased from 4 years to 6 years and the Duma’s term—to 5 years. There is no doubt that Medvedev’s “suggestion” will be regarded as an order by members of Parliament. They have already responded to his speech and expressed readiness to vote for any Kremlin’s amendments to the Constitution. A referendum on this issue is not required, so adopting the new legislation will be easy and quick. Some deputies have even said that Medvedev’s current term may be prolonged till 2014 instead of 2012 (and Duma’s till 2012 instead of 2011). Later and rarer elections will somewhat ease the Kremlin’s fear of an “electoral revolution”—its worst nightmare since the uprising at Kyiv Maidan. The changes, if passed, will become the first amendment to the Russian Constitution since it was adopted on a referendum15 years ago. Medvedev’s predecessor, Vladimir Putin, has always been repeating that the Constitution doesn’t need any changes. He preferred to simply ignore it: when he abolished elections of regional governors, submitted the Parliament to himself, technically introduced censorship and political repression, violated independence of courts and property rights. But some things still couldn’t be changed without amending the Constitution, like the length of president’s term or the two-term limit. As usual with KGB, Putin didn’t do the dirty part of the work himself, he used Medvedev instead. Ironically, the first changes to the Constitution were suggested by the person elected to his office at the staged and fraudulent elections that lacked even minimal legitimacy. Then they are to be approved by the undemocratically elected Duma lacking any real opposition and then by the Council of Federation whose members haven’t been elected at all. To add to this picture of cynicism, this is done while praising the Constitution and its standards of democracy at a pompous celebration of its jubilee planned for 12th December. The plans to change the Constiution were immediately condemned by the opposition and don’t seem to be popular among regular people. The emerging united democratic movement Solidarity called Medvedev’s actions illegitimate and antidemocratic. The Other Russia coalition plans to hold a Dissenters’ March in December that will demand that the Constitution remains untouched. People who discuss the issue on the Internet and in the street also criticize the changes. The government, however, prefers to ignore the public opinion. As the opposition candidate in the USA receives congratulations on winning presidential elections, Russian ruling elite shows once again that it’s not going to pass power to anybody else. Comparison of Russia’s first amendment to the Constitution to the American First Amendment perfectly symbolizes that development of democracy here has gone terribly wrong. Why Fight Crisis If You Can Hide It? Russian stock markets had a hard day today. Two main indexes fell at rates unseen since the August 1998 supercrisis: RTSI lost 19.1% of its morning value, MMVB lost 18.7%. Among the most unfortunate companies are giants like NorNikel (mining), Sistema (telecom), VTB (bank), UralSvyazInvest (telecom), and even Rosneft (petrol) who stole bought YUKOS’ assets. This drop was the biggest in the world and is perceived by many as the end to the Putin’s “stability”. The long-promised economical crisis is not at the doorstep any more. It is here and its scale appears to be greater than anywhere else in the world (except maybe just for Ukraine with its traditionally weaker economy). What’s notable is the reaction of Russian media, TV in particular, to this historical event. The two major TV channels (both state-owned) didn’t even mention this “black Monday”. On the contrary, while stock brokers were watching RTSI and MMVD indexes falling a point after a point, ORT and RTR news hosts said that “Russian economy is more protected against the crisis than economies of other countries”. They showed Dmitry Medvedev meeting in Kremlin with oligarch Mikhail Friedman whose assets include shares in cellular operators MTS (dropped -17% today) and Beeline (-23%), X5 Retail Group (-28%) et al. Friedman and Medvedev were telling each other that Russia’s economy is safe and that this crisis provides more opportunities for the national business. Then TV channels showed foreign stock markets and reported that Dow Jones passed a “psychological mark” of 10,000 points. None of them took time to say that Russian RTSI passed a “psychological mark” of 1000 points and then another “psychological mark” of 900 points with ease. This way of dealing with the crises and avoiding their political consequences reminded me of a well-known Soviet story. When Chernobyl nuclear plant exploded and caused fallout in the whole Eastern Europe in 1986, Soviet television didn’t mention it. They thought it would cause panic and undermine the image of USSR at home and abroad. A few days later citizens of Kyiv and other Ukrainian and Belarussian cities next to Chernobyl participated in the traditional May 1st demonstrations in support of CPSU under radioactive rain. Several days later, however, fallout reached Scandinavia and was noticed by the West. Soviets then had to admit not only the disaster but also their lies and attempts to hide it. Looks like the modern Russian media chooses the same strategy. I have just returned home from Helsinki where I had participated in the Finnish-Russian Civic Forum. It was a great opportunity to meet new colleagues and discuss problems of Russian democracy. I met Robert Amsterdam, who is well-known as a Mikhail Khodorkovsky’s attorney and an owner of the brilliant Web site, dedicated to Russia. Yesterday they published my new column with criticism of international human rights organizations. Unfrotunately, much of this criticism is also true of Russian human rights NGOs. Wish We Had Your Problems! There seems to be a tradition that whenever a foreign human rights organization publishes a report on Russia, Kremlin-backed politicians call it groundless and based on double standards. So, unsurprisingly, the Amnesty International World Report 2008 got cool welcome. For example, a member of Putin’s Civil Chamber, Anatoly Kucherena, immediately condemned the “wholesale criticism” and “ideological implications” of the report. However, if the “official” human rights activist had taken the time to read the report or, even better, to attend its presentation in Moscow, he wouldn’t be so upset. Amnesty International presented their report in Moscow on May 28 along with their memorandum to Dmitry Medvedev. The press conference began with a statement that there was a positive change in the situation with human rights in Russia in recent years. This is something completely opposite to my observations that the country is drowning slowly into dictatorship, with new barbaric laws and new political prisoners appearing every month. Even the situation in Belarus under the infamous Alexander Lukashenko – “Europe’s last dictator” – sometimes seems more optimistic than in Putin’s Russia. Two thirds of the press conference was dedicated to human rights abuses… in the USA and the European Union. From tortures in Guantanamo to school segregation for the Roma people in Slovakia—it seems that everywhere in the West you will face violence, injustice and suffering. At the same time, there was hardly any mention, for example, of the dozens of National Bolsheviks serving their terms in Russian prisons for nonviolent protest, or of Mikhail Khodorkovsky and his colleagues being put in jail for not toeing the Putin’s line. The conclusion that Amnesty’s speaker made out of this was paradoxical but it fit the picture well: European and American politicians don’t have the moral right to demand that other countries respect human rights as long as there are serious problems in the West itself. Otherwise, they are clearly conducting a policy of “double standards”. Don’t get me wrong, I really hope that tortures in Guantanamo are stopped and schools in Slovakia desegregated. Pointing at such problems is very important as it lets the West remain a beacon of human rights in the world. But who can explain to me the point of telling all this to journalists in Russia? In Russia, where freedom of expression is technically abolished; where elections are forged; where police beats, arrests or even shoots at peaceful demonstrators; where dozens of opposition activists, businesspeople and scientists are in prison for political reasons; where dozens of others disappear without a trace every year in Chechnya and Ingushetia; where hundreds of soldiers commit suicide unable to bear dedovschina [violent hazing of recruits]? In Russian, one would say: wish we had your problems! Of course, Amnesty International intended to appear objective and independent of the Western governments. They hoped that if they criticized Washington and Brussels, the Russian authorities wouldn’t accuse them of being “American agents of influence”. They believed that praising the Kremlin’s policy would make them more trustworthy in Medvedev’s eyes. Maybe this would be the case with some other government, but not with this one. Comments like that of Mr Kucherena were the only reaction from the Russian political establishment. I doubt that Amnesty will even get any response from the Presidential Administration, not to mention any real improvement of the human rights situation. However, some people in Russia will surely make use of this press conference. It doesn’t take an expert to tell how the Kremlin’s propaganda will love such statements about the West’s “moral rights” and “double standards”. By the way, the day after that presentation, Vladimir Putin said in Paris: “All this talk about human rights is often used as an instrument of pressure on Russia, with the aim of achieving some goals that have nothing to do with human rights in Russia… Problems with human rights you have in any country”. Is he quoting Amnesty International or vice versa? Unintentionally, the Western human rights activists gave the Russian authorities an excuse for mass human rights abuses and weakened the not-so-strong attempts of the West to influence the Kremlin’s domestic policy. P.S. : To be honest, Amnesty’s report does mention a lot of real and serious problems with human rights in Russia. Unexpectedly to me, they even recognized me as a prisoner of conscience for having served a 13-day term in jail for attempting to participate in a Dissenters’ March. However, this was done too late—a week after my release. Amnesty’s officer apologized and explained to me that they have too little staff in Russia and too much work.